Description: A westbound mixed freight is about to roll through CP Burn. Description: NS SD60 6639 was the middle unit on this westbound freight. Description: Ga. 347 screams up the hill at Brown with hot freight it tow. Description: EMD SD-60 is the leader for NS B-32 bound for Indianapolis. Description: NS 6639 is in charge of B-32 and is now bound for Indianapois. Description: Westbound NS train #239 heads for Centralia with some autoracks. Description: Westbound NS train #239 passes a bean field heading for town. The front door is open to get some air in on this hot and humid afternoon. Description: "One twenty late" comes through Brown Summit, NC, with a mixed bag of power. Description: NS 6639 leads a southbound out of Oakdale on the Rathole. 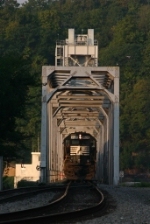 Description: Train 27B crosses the Mississippi River Lift bridge into East Hannibal at 7:35am. Description: NS 197 turns the corner onto the New Castle District from the Huntington District at Hogo. Description: It was pointed out to me and really its so true that the nice thing about trains in Harrisonburg is the variety of angles one can view from.